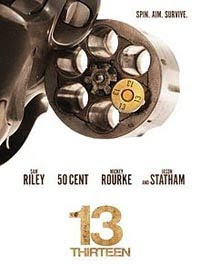 13 (2010), written and directed by Géla Babluani, is an English movie, a remake of the 2005 French movie, 13 Tzameti. Synopsis: A naive young man, Vince (Sam Riley), assumes the identity of a dead man, without knowing the price he has to pay as he gets himself embroiled in a clandestine world of violence and chaos whereby wealthy and powerful men gamble on the lives of other men behind closed doors. Gripping, anticipating, and exhilarating. These are the sensations you'll get because unpredictability rules throughout the entire movie and you've no idea what to expect and what might happen next. This is especially true during the scenes of a circle of men each with a bullet in the chamber, waiting to pull their trigger. I've to cover my eyes and ears as adrenaline courses through my veins. Argh! The supporting cast is rather impressive - Jason Statham, Mickey Rourke, Ray Winstone, David Zayas, 50 Cent, and Alexander Skarsgård. Although their characters are not fully fledged out, they give crucial support to the movie. I don't really like the ending but I guess that's the way this movie conveys its final message to us. By right, we all should get the point: Money isn't everything. What's the good of it when you gain lots of money and yet lose your life? Oh well, by all means, this movie is recommended.